Television's favorite alien life form is back with all-new material, when the comedic pop-culture icon ALF makes a special return to television for "ALF Week" (July 16-19, from 7:30-10pm) on The Hub TV Network, a destination for kids and their families. The beloved, wise-cracking alien will host the network's primetime programming lineup for the week-long event, featuring ALF's brow-raising, sense of humor as he gives his take on favorite episodes of his own series and classic shows on The Hub primetime, which are Mork & Mindy, Happy Days and The Facts of Life. Viewers can learn what ALF has to say about life since his popular series was produced in the late 1980's as he was living with the Tanner clan. ALF will lead into these three comedies starting at 7:30pm for this special week. The week will kick-off changes to the schedule in primetime. ALF will air in the 7:30pm half-hour the week of July 16, as the sitcom marathon blocks move up to 8-10pm, rather than 9-11pm. ALF was airing at 8:30pm since it launched, but for this week only it will air at 7:30pm. The 10pm hour every weeknight will now have the return of The Wonder Years to weeknights, since the marathons are 8-10pm now! Mork & Mindy will remain on Mondays, but from 8-10pm, while Happy Days remains on Tuesday shifting to 8-10pm, and The Facts of Life stays on Wednesdays but with the change to 8-10pm. 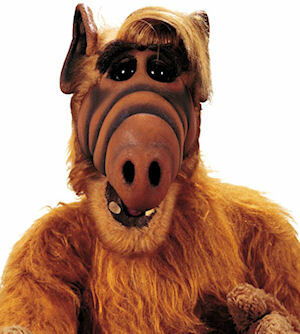 On Thursdays, the block will now be ALF from 8-10pm, replacing Sabrina the Teenage Witch. What will happen to Sabrina now? We don't know just yet, but it is still on the schedule in late nights on weekends (Fri-Sun, 3-4am). ALF will not air at 7:30pm starting July 23, so perhaps Sabrina will move there? We'll let you know soon. But the new primetime schedule from 8-10pm and The Wonder Years hour at 10 will remain after the ALF Week as well, as it is their new primetime schedule. Laverne & Shirley and Batman remain at 11pm. After an animation break, the primetime block will encore late night still as well beginning at 2am ET (1:30am for ALF the week of July 16). On weekends, Lois & Clark is doing well and will remain airing 8-11pm in primetime on Sundays, with an immediate encore from 11pm-2pm. Stay with us for further updates on The Hub schedule, as we will confirm Sabrina's timeslots soon. We mentioned a while back about the new network from NBA legend Magic Johnson coming soon, now it has launched. ASPiRE, the new television network from Magic Johnson Enterprises, launched Wednesday, June 27 at 8:00 pm ET with a unique mix of original and groundbreaking programming aimed at African-American viewers. The network launched with inaugural distribution partners Comcast and Time Warner Cable. At launch, ASPiRE is available in approximately seven million homes and in 16 of the top 25 African-American markets including New York City, Atlanta, Chicago and Washington, DC. ASPiRE also launched on FAVE TV and with five charter brand partners: The Chrysler Group, L'Oréal USA, Nationwide Insurance, Coca-Cola and Walmart. ASPiRE celebrated its historic kickoff on June 27 with a private, star-studded event at Cipriani Dolci in New York City. ASPiRE's mission is to entertain, enlighten and inspire. It will shine a light on the positive contributions African-Americans have made to American culture and be a window through which we can experience the next generation of ground breakers and game changers. ASPiRE offers a diverse slate of programming spanning five categories: movies (including features, documentaries and short films); music; comedy (vintage sitcoms); visual and performing arts; and faith and inspirational shows. The network's initial schedule has many programming blocks. Of note for us is: Groundbreaking Comedies (Tuesdays, 2pm, 8pm & 11pm) – Hosted by actor and comedian Jonathan Slocumb (Meet the Browns, The Steve Harvey Show), ASPiRE's Groundbreaking Comedies will celebrate trailblazing Black funnymen and women with iconic TV series including The Bill Cosby Show (Chet Kincaid), The Flip Wilson Show and more. Slocumb will share with audiences the known and not-so-known facts about the shows, their stars, and their enduring influence on popular culture. Besides The Bill Cosby Show and The Flip Wilson Show, which also airs weekdays, the network is also airing the '60s sitcom Julia every weekday from 1-2pm and 7-8pm. In addition to Tuesdays, The Bill Cosby Show airs weekdays 12-1pm, 6-7pm and 2-3am, while The Flip Wilson Show airs weekdays 10-11pm. 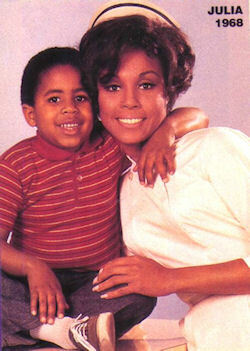 Also on the schedule is I Spy weekdays 11am, 5pm and 1am and Soul Train weekdays 10am and 4pm. View the ASPiRE website and see if it is available in your area! Stay with us for further updates and we hope more vintage comedies are coming!